Evolution is slow. At least, that is what we are told (especially by advocates of the Paleo Diet, who model their cuisine on the foods favored by our Pleistocene ancestors). The central dogma of biology centers on the importance of DNA as the recipe for a organism, which changes only by random mutation or gene shuffling during sexual reproduction. Bad memories of Lamarckism make us hyper-vigilant against heretical thoughts of acquired transmissible traits. Recently, however, the importance of “fast” changes, like epigenetics has become harder to ignore. A few news stories highlight some of the tricks evolution has to make rapid changes. 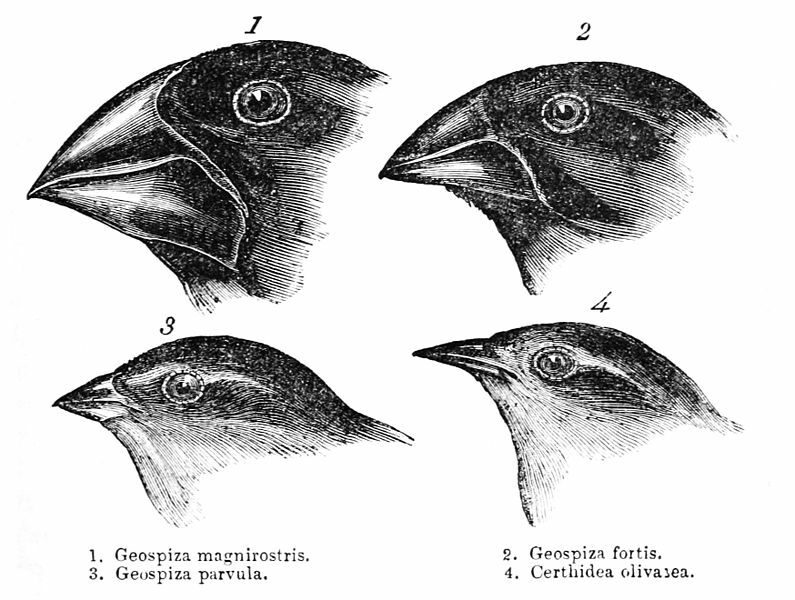 Darwin’s most famous observations were the diversity of bird beaks, and how specialized they could be based on the target food. 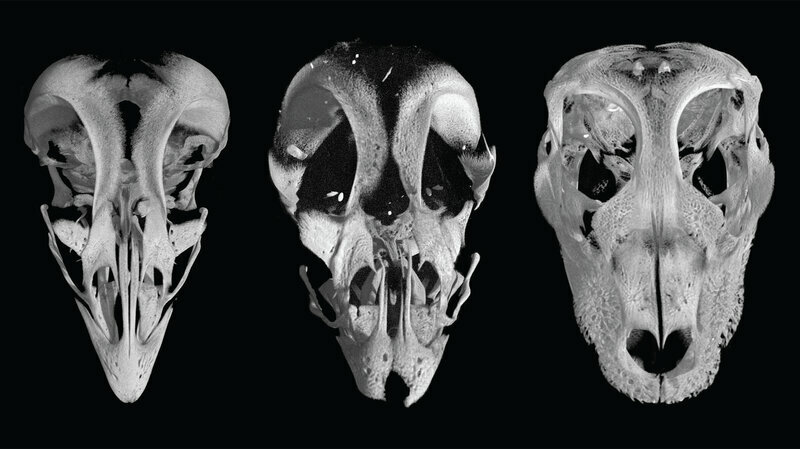 Modern scientists have established that modern birds descend from Dinosaurs, and have now succeeded in reverting some beaks back to atavistic dino-snouts. This was accomplished by blocking the activity of just two proteins, demonstrating how easily evolution makes variations on the theme to match the appropriate condition. That is, the “hard part” of making a snout/beak only had to be done once. Also, in the Washington Post, the evolutionary psychology of sexual selection is updated with the claim that (what I’m calling the) “Silverback Suburban Dad” is the new “Alpha Male”. The idea is that working women in modern developed countries should be (and are) more attracted to older, high status, responsible fathers – compared with the muscular brute that caught the eye of the Stone Age ladies. The author cites a study that women in developing countries, where physical strength is relatively important, are more attracted to masculine features. The point is that preferences are malleable based on the circumstances. I have some doubts about how big a change this really is: High status was crucial even to primate males on the savanna looking for a date; conversely, tall men still enjoy a boost on Match.com. In simple organisms like bacteria, sensing apparatus is expensive, but reproducing is easy, with short waiting times between generations. That makes a “dandelion” strategy attractive, in which many offspring are released, and letting the best find their appropriate niche, like the lucky few seeds randomly landing in the sidewalk cracks. But for Humans, who wait much longer to reproduce, evolving the ability to adapt to various situations it’s better. Like Alan Turing’s eponymous machine, the best solution can be an all-purpose device. Biologists like to emphasize that humans have found a way to thrive in vastly different climates. Steven Pinker tells us we are not a “Blank Slate“, and that our mind is at least somewhat pre-arranged for the physical world we inhabit (otherwise Newtonian and Quantum physics would be equally intuitive). But that still leaves a lot of room for adapting. If a baby from the modern US and another from ancient Mesopotamia were somehow switched at birth in a weird Sci-Fi-Rom-Com movie, I’m pretty sure everyone expects each child to be perfectly adjusted. To explain why two famous individuals hail from the same hamlet, one would have to claim either (1) there was some preexisting reason why living in Hope AK makes one more likely to run for governor and president OR (2) once Bill Clinton ran (successfully), others in Hope hoped to follow in his footsteps. Neither of these explanations is compelling. There a 2430 regular season MLB games every year. The moral of the story is that there are many chances for weird things to happen. On the contrary, we should be surprised if NOTHING crazy occurs. UPDATE: In another great example of rare baseball occurrenes happening twice, the Colorado Rockies managed to strike out four times in the eighth inning two nights in a row. Four strikeouts in the same half-inning is possible if one reaches base via a dropped third-strike, which is more common than one might suppose. The Rockies racked up numbers 74 and 75.